This is another project I started about two and a half years ago, but never got around to properly finish. 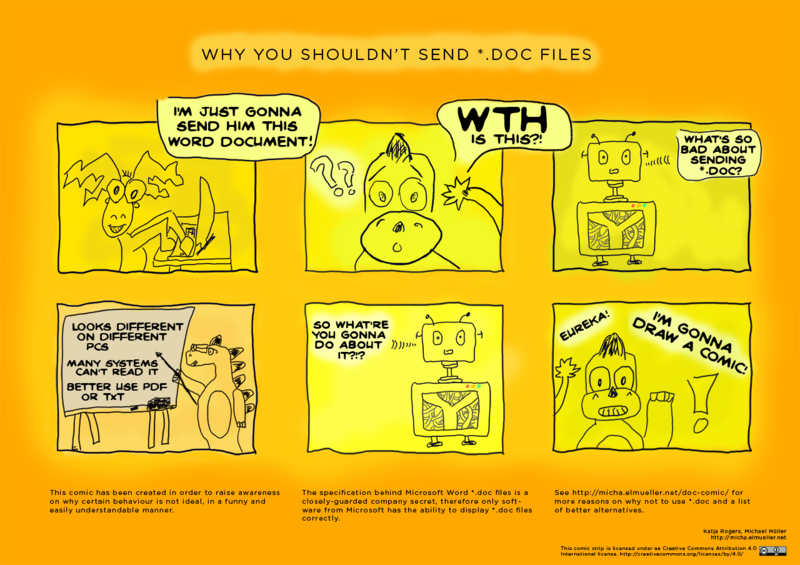 The idea came about when encountering some of the annoying things which some people on the internet do: forwarding chain-mails or mailing *.doc files, for example. It is oftentimes not that well taken when answering such mails with an — even friendly meant — explanation why such a behavior is annoying. So the idea of drawing a comic which explains the issue in a brief and funny way came about. Everybody likes comic strips, right? So instead of replying such *.doc mails with a textual explanation it would be more practical (and probably the sender would take it better) to link a comic strip. All files are licensed under a Creative Commons Attribution 4.0 International license (CC-BY 4.0). The original idea included creating a series from the comic. I’ll see if I get around to do that. If you have any ideas for fitting topics in such a series, please feel free to comment this post or mail me.